Let's get you started with a good energy overview video before going into more details. Bill Gates give a healthy overview on the energy situation and future. Here we will show you that more than 80 percent of today's energy demand is still produced using fossil fuels, causing significant harm to the environment in the form of greenhouse gas emissions and pollution. You will also understand why investments in renewable energy sources are not scaling as fast as expected, and a 100 percent reliance on renewable energy sources is becoming more and more unrealistic. Based on the growth trends, the world will inevitably be resource and carbon constrained in transition to sustainability. The society and the economy will have to go through major transformations, and the environment and the supply of resources will be under pressure. How can we supply the world’s growing energy demand with clean, safe, affordable and scalable energy? World population will continue to grow before stabilizing around 10 billion people. Nearly all of this growth will be in the less developed countries. At the same time, urbanization will grow and population will become older. Population Growth. ​World population is estimated to increase by 2 billion people to more than 9 billion by 2050, driven mainly by population growth in the emerging economies that will represent 85% of global population. Shift in Global Economic Power. 60% of global GDP will be in these emerging countries by 2050. Increased Urbanization. We expect to go from 3 to 6 billion people living in cities in 2050. The new infrastructure will be built in Asia and Africa. Aging Population. We are not only becoming more people, we are becoming older. Today we are some 500 million people over 65. By 2050 this will have increased more than 3 times to above 1.6 billion. ​Demand for energy in the world will continue to grow as population in the emerging countries grows. The focus in these countries is to improve quality of life and reduce poverty, which requires economic growth and more use of resources, not the least energy. Any decrease in energy consumption in the developed nations as a result of efficiency improvements and more conscious use of energy will be more than offset by an increase in demand in less developed parts of the world. A generally accepted assumption is that world demand of energy will rise by 50% by 2050, with no growth in the OECD countries. More than 80 percent of today's energy demand is produced using fossil fuels. Despite significant investments in renewable energy capacity, the structure of world energy consumption has barely changed over the years, and carbon emitting sources continue to dominate. 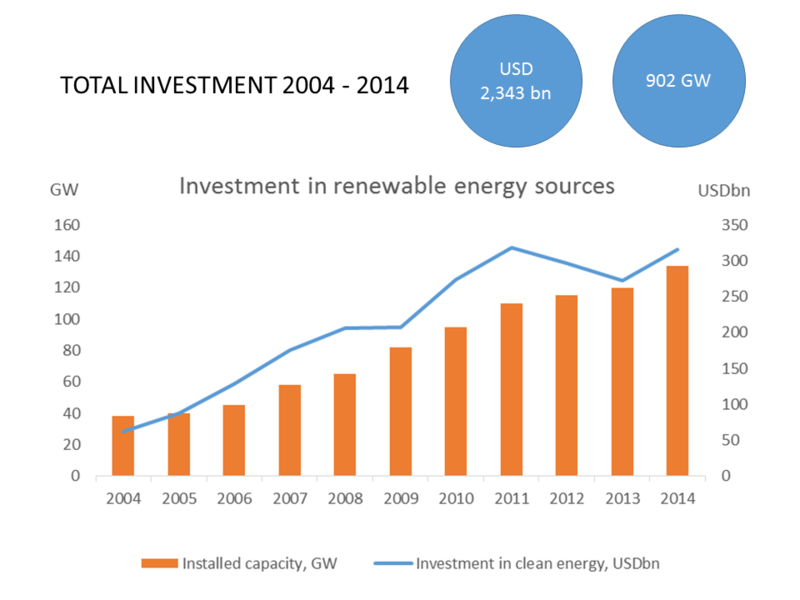 A total of USD 2,343bn has been invested in renewable energy capacity between 2004 and 2014. If we leave out hydro, the total investment amounted to an estimated USD 1,800bn. With these investments, the capacity of renewable energy sources increased an estimated 902 GW. If we leave out hydro, total capacity has increased an estimated 550GW. 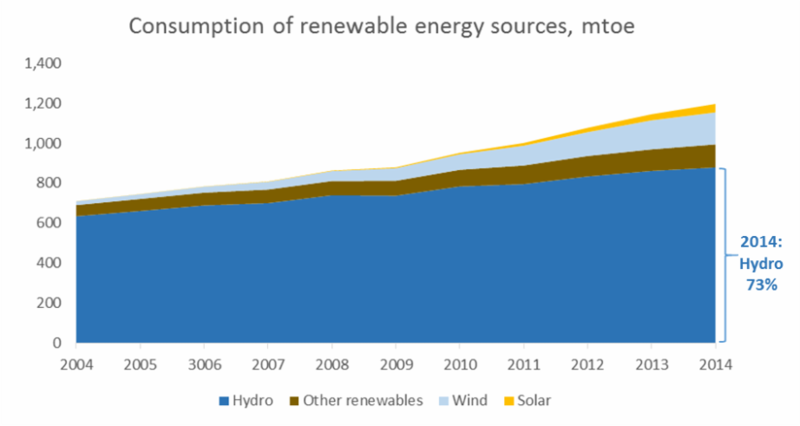 In 2014, the consumption of renewable energy sources amounted to 1,196 mtoe, an increase of 485 mtoe compared to 2004. If we leave out hydro, the consumption of renewable energy sources amounted to 317 mtoe in 2014, an increase of 241 mtoe compared to 2004. 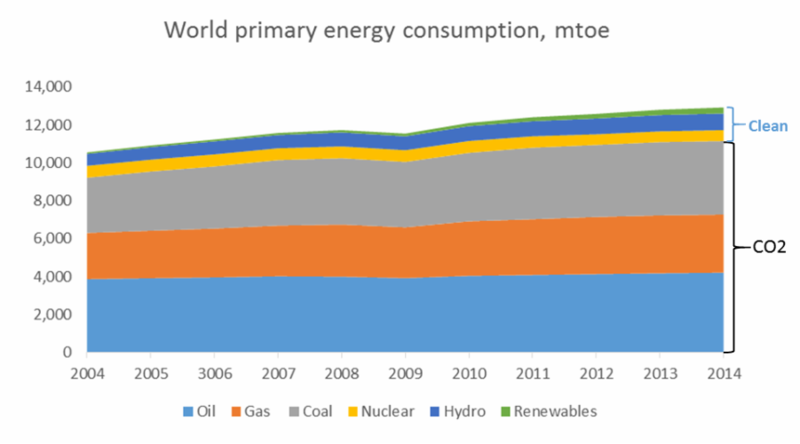 The share of renewable energy sources of total world primary energy consumption amounted to 9.3 percent in 2014, and 2.5 percent if we leave out hydro. To put this number in perspective let’s compare it to the massive nuclear power program started in mid 70’s in France, where the country installed 56 reactors over 15 years at an estimated cost of some FF 400bn in 1993 currency, i.e. some EUR 84bn or USD 76 bn today taking inflation into account. As a result of this decision, France now achieves a substantial level of energy independence and almost the lowest cost electricity in Europe. It also has an extremely low level of CO2 emissions per capita from electricity generation, since over 90% of its electricity is nuclear or hydro, nuclear’s share being some 75 percent today. If from these figures we calculate an estimate for how much it would cost to build a nuclear infrastructure that supplies 100% of world energy consumption, we end up at a figure of USD 10 trillion. 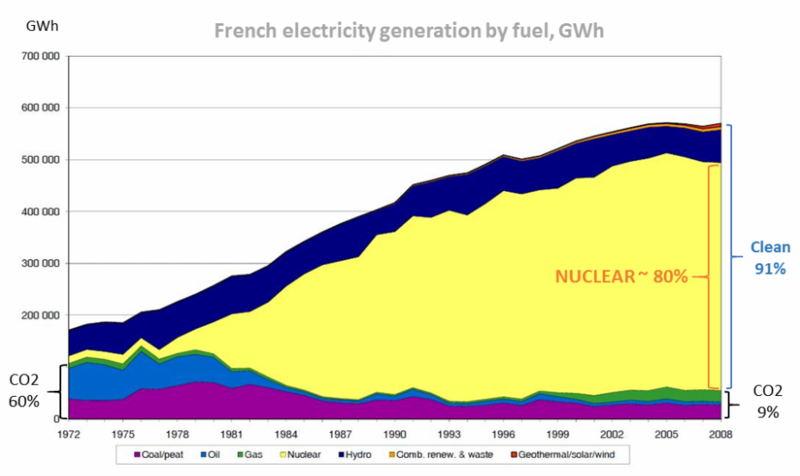 This is based on the cost of France’s nuclear infrastructure (USD 76bn), France’s share of world nuclear consumption (17.2%) and nuclear’s share of world energy consumption (4.4%). This points to renewables (excluding hydro) being 13 times more expensive than nuclear. ​Why is the huge investment in renewable capacity not reflected more dramatically in renewables share of world energy consumption? One reason is the capacity factor, i.e. the ratio of actual output over a period of time to its potential capacity if it were possible to operate at full capacity over the same period of time. The capacity factor for solar and wind is an estimated 10-25 percent and 20 percent, respectively. As comparison, the capacity factor for hydro power is 40%, for a coal fired power plant ~ 70% and for nuclear ~ 90%. Indeed, renewable energy sources are intermittent, dilute and location dependent (more on this later). In order to avoid long-term changes to climate, the world must cut greenhouse gas emissions by 80 percent by 2050 and eliminate them entirely by the end of the century. In order to eliminate the 36 billion tons of carbon dioxide, emitted in 2015 to produce energy, we must shift from an energy infrastructure based 80 percent on fossil fuels to an energy system based 100 percent on carbon-free energy sources. ​The world needs an ‘on demand’ energy source that is clean, safe, affordable and scalable. Carbon constraints speak for a future energy mix consisting of renewables and nuclear. A 100 percent reliance on renewable energy sources is becoming more and more unrealistic. Nuclear energy can complement the intermittency of renewables and deliver high density energy, on demand. The question is not whether renewables will or can provide 20 or 60% of world energy consumption. It is whether we have an accepted zero carbon energy source to go with it that is ready to scale up? If the answer is no, we don't have that energy source, then it is about time each stakeholder start investing. How do we supply the world’s growing energy demand with clean, safe, affordable and scalable energy?